Ladies could not own property! We know little of Mary Maccullagh, we don’t even know if she lived in Bollington. 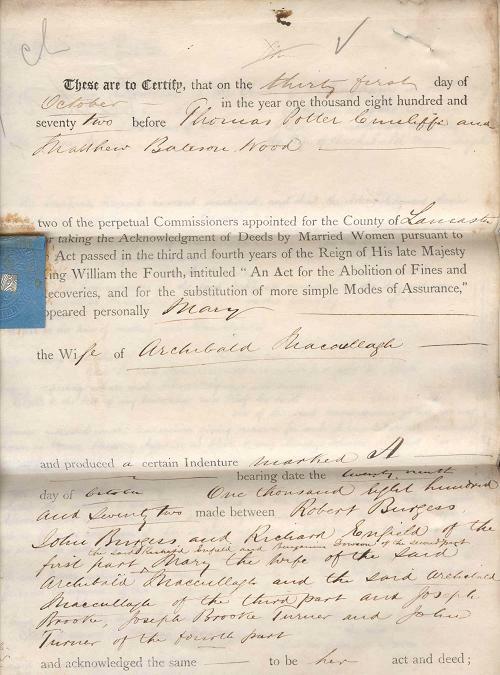 However, we have a legal document dating from 1872 that shows that she owned property in the town. Alas the set of documents is incomplete so we don’t know which property she owned. The purpose of the documents was to transfer the ownership of the property from Mary to her husband, Archibald Maccullagh. This was necessary in earlier times because women were not permitted to own property. Sometimes they came by property as a result, for instance, of becoming a widow, or having it left to her by her deceased father. When this occurred it was necessary for the property to be transferred into the ownership of her husband. This is what this document set out to do. This procedure was often misused by devious men. They would identify a wealthy widow, one who owned a useful piece of property. The lady would in all probability be keen to find herself a new husband for this bestowed many advantages upon her in society in those days. She would be courted and married. Soon after the matter of her property would arise and under the law of the day she would be obliged to transfer ownership to her new husband. The evil of his intentions would then be disclosed when he sold the property and left her in the lurch without a penny.